Now: The exterior of 44 Union Square East as it currently looks (Photo: Landmarks Preservation Commission). Proposed: BKSK Architects wants to add a glass dome to the building (Photo: BKSK Architects). 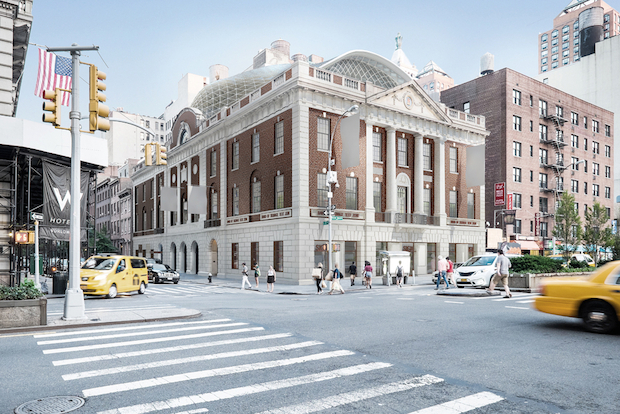 UNION SQUARE — A major renovation is coming to the former Tammany Hall headquarters in Union Square where owners want to put a new glass dome over the landmarked building and demolish a theater to make way for retail and office space, the project's architects said. The historic structure at 44 Union Square East, built in 1929 to house the Democratic Party machine, will undergo a major overhaul that will restore the facade, gut the existing theater and add windows and glassier storefronts, according to BKSK Architects which is designing the project. The most striking change will be a new 30-foot glass dome on top of the building, which will add about 27,000 square feet to the structure and will house office space, according to Harry Kendall, a partner at BKSK. After hearing a presentation about the proposal this week, Community Board 5’s Landmarks Committee voted unanimously to reject it, saying the changes would be too drastic for an historic building that was just landmarked last year. The Landmarks Preservation Commission designated the building as a landmark in June 2013, noting its references to early American architecture, including Colonial columns out front. The building's design drew inspiration from the original Federal Hall in Lower Manhattan, where George Washington took his first oath of office. The Union Square building was designed as headquarters for Tammany Hall, but shortly after it opened in 1929, the political machine began to lose power amid corruption scandals that led to the resignation of the city's mayor, Jimmy Walker. At Tuesday night's meeting, CB5 members were concerned about the plan to demolish the building's existing slate roof and replace it with the dome, as well as the plan to remove decorative terra cotta placards on the side of the building and replace them with windows. The community board's opinion is advisory, and the city's Landmarks Preservation Commission will hold a public hearing on the project on Nov. 18 before making a final decision. It wasn't immediately clear whether the current tenants of the building, including the New York Film Academy, a liquor store, a smokeshop and a deli, would be affected by the renovation. Workers in the businesses said they weren't aware of the proposal. The building's theater, which is rented out for various productions, will be replaced with retail and offices, according to a spokeswoman for BKSK Architects. The owner of the building, Liberty Theaters, Inc., did not respond to requests for comment. Layla Law-Gisiko, chairwoman of CB5's Landmarks Committee, said she worried that if the proposal was approved, it would set a precedent for major changes to other landmarked buildings. Editor's note: An earlier version of this story misstated the height of the planned dome. It will be 30 feet tall.